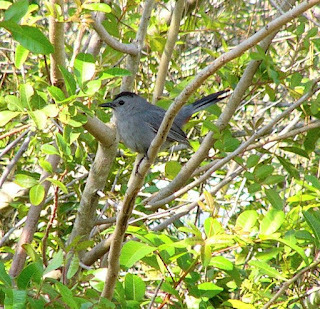 He was far from the shy recluse that Gray Catbirds are supposed to be. I should have taken more pictures, when my little red butted friend (look closely at the second picture and you'll see his rust colored under tail feathers) came out every afternoon around 4pm. He may still be here - I'll look tomorrow. I heard him singing his meowy cat song a few days ago. That usually means it's getting to be mating time and time to go back home to breeding grounds. I would be sitting in my lawn chair not 6 feet from his favorite "appearance" area - and there he'd be. He would peek out and then hop out from the opening in the bougainvillea, look for any treats I might have left him there and then move on to find peanut butter. 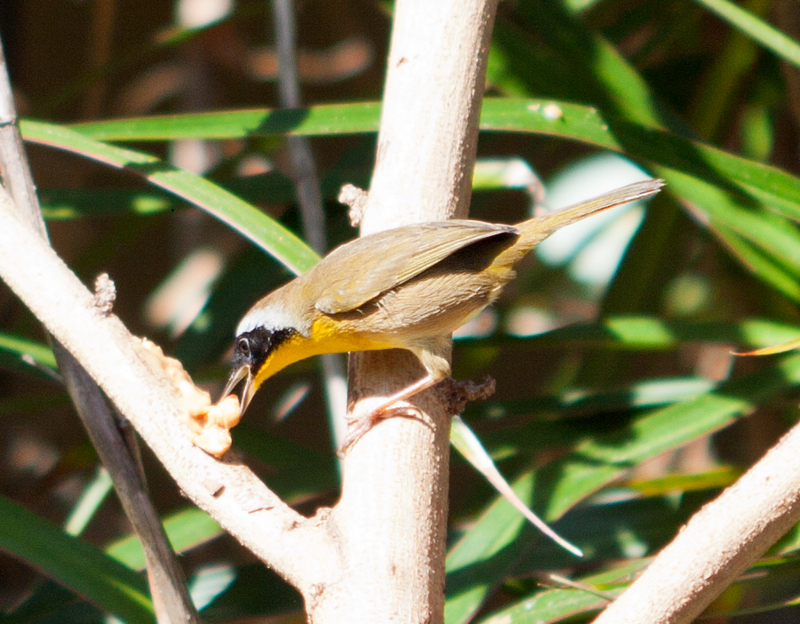 I would leave him pieces of ripe passion fruit from my vine - he loved those!! 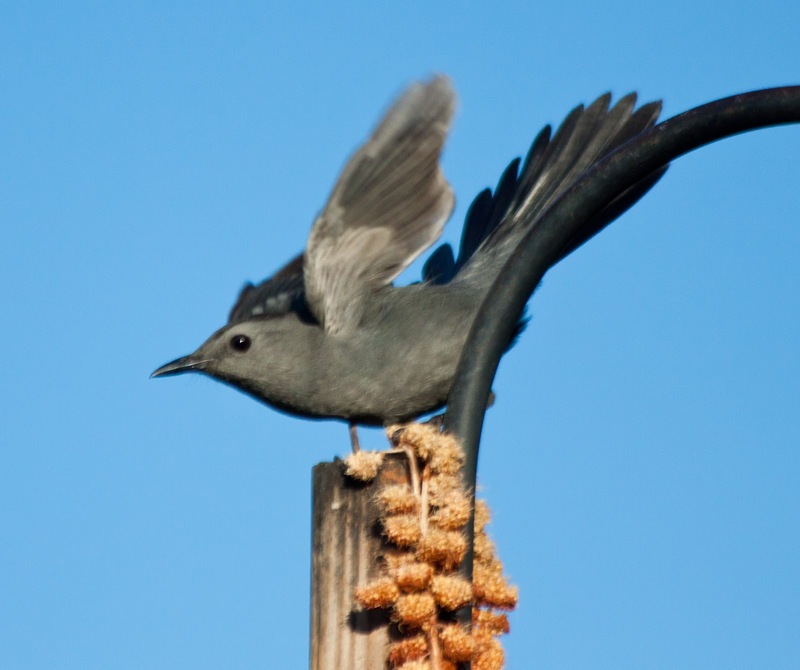 Who ever heard of a wild Gray Catbird eating peanut butter (don't worry - it is natural, not full of preservatives and chemicals)!! In the last picture, Mr. Catbird is on the branches upon which I might spread a little peanut butter. It was fun to watch him eat it and then go for some water. "Cheeky-Boy", the male Common Yellowthroat, left a few weeks ago, at the end of March. 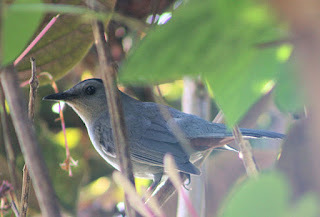 He was my favorite, flitting among the bushes directly around the screened in porch starting before the sun came up. His little masked face was so sweet and you can tell I miss him and hope he comes back in the fall. In the pictures above my little Cheeky Boy is eating the same thing the Gray Catbird unexpectedly liked - peanut butter. How funny is that? 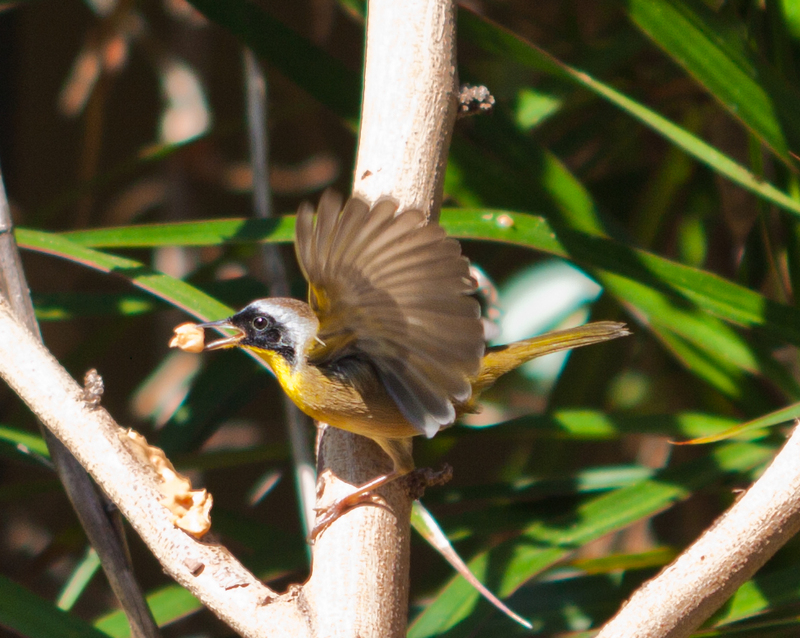 Common Yellowthroats are seen in the Everglades all year round. In the wild they live in the marshy areas and cruise along the ground for goodies. I think they eat bugs like most warblers. Poor Cheeky Boy won't find much peanut butter in the wild, but that's probably a good thing, really. I don't know where his nick name came from but one day as I was watching him gad about my yard, in and out, not shy in the least, I thought he was delightfully "cheeky" or fresh, like a little flirt - so I guess that's why I called him that. I need to give Mr. Catbird a name, but none came to me. I haven't named the Painted Buntings either - it doesn't seem proper, not in the same way as the little masked warbler. I feel as if these little birds that God sends me every year are His gift to me; and I make sure I take good care of them in return. I keep the feeders full for those who eat seed and provide caged feeders for the smaller birds who are frightened of the parrots and grackles and jays we have, not to mention the squirrels that hang upside down next to a feeder and grab it periodically to get some more food. I love them all, mammal and bird. There are places for them to hide in the brush and a pool of water with a filter that keeps it moving. There is a birdbath in which the water is changed daily. In the rainy season, all this slows down. No need to worry about filling pools of water or birdbaths in the summer - the rain does that every day. In the summer we concentrate on butterflies and dragonflies in the garden and the only bird feeding we do is peanuts for the Bluejays and squirrels in the morning and evening. These little avian visitors are my companions as I sit outside and watch them come for breakfast in the morning. Sometimes they perch on a branch and wait for me to finish filling feeders or filling the birdbath; then as soon as I sit down, they come and eat or drink. I can't tell you the intense soul pleasure these little creatures bring me. My backyard is truly my little pocket Eden - in all seasons. This year we've had one fully colored male Painted Bunting and 4 "Greenies", which could be females or immature males. They are also still here. Last year they left during the first week of May and I heard the male sing maybe 2 days in a row before they left. This year the male buntings (which I now know includes one of the greenies because I saw him singing and only males sing) began singing over a week ago and have not left yet. They sing in my bougainvillea bush so sweetly. I'll have to keep an eye out now because every day they may be gone - for all I know they have gone today while I was at work. I'll clean their feeders and make sure we are ready for all of them to come back in the fall.